The Milwaukee Brewers biggest star today is a career .200 hitter who´s never even played for the team. 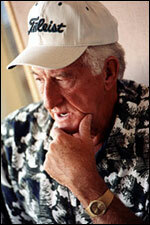 But Bob Uecker, the radio voice of the team for 32 years, has just about done it all. Now, he has agreed to act as Honorary Chairman for the ISAR 2002 Competition.